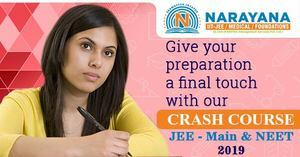 With the JEE mains exams nearing, everyone is worried about the results. Do not let your efforts wasted. Join Narayana crash course and brush up the most important topics and points.